Like electricity generated from the wind, electricity generated by harnessing the sun’s energy is renewable, infinite, and pollution-free. 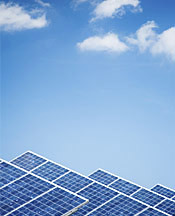 Photovoltaic (PV) panels consisting of multiple solar cells convert sun directly into electricity. PV solar panels rely only upon the sun’s energy and do not need to be supplied with raw materials whose extraction and combustion is damaging and costly, unlike traditional power plants that must continuously burn fossil fuels to produce electricity. PV panels are dependent on light, not heat, and therefore solar power can be utilized throughout the U.S. and in addition to sunny places like California or Hawaii. In fact, New Jersey is the second leading state for PV panel installations. Unlike wind farms, hydroelectric power plants, or traditional power plants, each of which are stationary due to their size or reliance on specific conditions (for example, wind farms must be located on very windy land), solar panels can be installed practically anywhere. Solar panels can be installed in deserts, on roofs or walls, and even integrated into buildings at the time of construction. Small, but numerous, solar installations throughout the United States will gradually help our country to phase out traditional, fossil-fueled electricity and usher in a new generation of clean, abundant, and renewable energy that can be employed to help stabilize domestic energy security and independence and allow us to be responsible stewards of our planet.